I’ve planted a small raised bed garden annually for the last 5 or 6 years in our rural northeastern Pennsylvania community where we spend half our week. The soil is organic and freshened every spring, and no herbicides or pesticides are allowed. The whole big garden is fenced and features a rainbird-type sprinkler system that waters it once a day, so dry spells aren’t a factor. We also have a hose for watering our plots ourselves as needed. The garden seems to be divided pretty equally between veggies and gorgeous flowers, mostly enormous Dinnerplate Dahlias climbing high with help from poles and trellises. We also have a community herb plot we can all use, and last summer it included curry, basil, oregano, spearmint, peppermint, and rosemary. 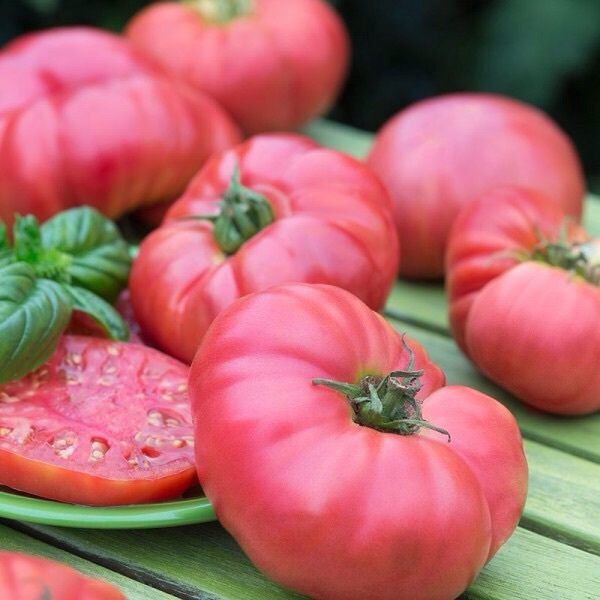 I love heirloom tomatoes for their tangy flavor and great texture, so I go for Mortgage Lifter. As a pretty strict (but not perfect) vegan, I love my tomatoes! Sometime I put ripe tomato slices with coconut bacon in a BLT with Just Mayo vegan mayonnaise for an amazing treat. Mortgage Lifter heirloom, courtesy of Bonnie Plants. Dinnerplate Dahlia, getting the name from the size of the blooms, and the plants can grow to over 6′ tall. I usually throw in a Big Boy or Big Girl tomato plant to get a nice variety. I usually have four tomato plants in my 4×4′ raised bed plot. I also plant Italian flat leaf parsley and enjoy it in my green smoothies all summer. It’s the last of my plants to get killed by frost in the fall. My plot is rounded out with basil, and marigolds are interspersed to discourage pests. Two years ago some critters got in and kept biting the ripening tomatoes on the vine, so I bought wildlife netting, but I didn’t need it last year. So here we are at Memorial Day weekend, and I was planning to buy my seedlings and get the garden in the ground tomorrow. We are in the 5b hardiness zone, which means that the average minimum winter temperature is -15 to -10 F. Our garden chief told us that the garden plots were ready to plant a month ago but urged us to wait until Memorial Day to plant, because it’s not uncommon for us to get a killing frost in May. 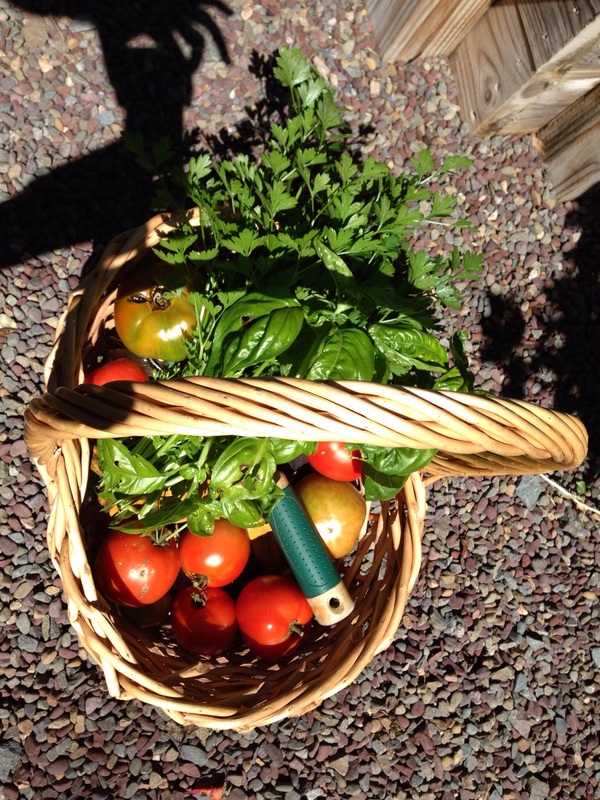 Last year I tempted fate and planted in mid-May, and thanks to a late frost, everything but the parsley died and I had to buy all new tomato and basil plants and try again. So I thought this weekend would be safe. Wrong! Thank goodness I haven’t bought the plants yet because last night it went down into the 30s F and some blossoms on our deck took a hit. That’s two years running with later frosts than we had been having up here. Then there were the past two winters which really pummeled the northeastern US. We had more snow than we knew what to do with. Add to these the tornados and droughts and flooding rains in various places not accustomed to them, and it seems we are in for a bumpy ride in the years ahead. But a few weeks ago, before the foliage of the shrubs, including blackberry canes, and trees began to fill in, the daffodil bulbs bloomed. We planted them years ago when my aunt brought them to me from Tennessee. Here’s a photo I took with my iPhone, as all my originals are these days! 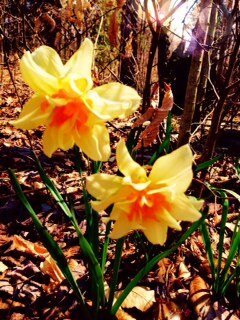 Early spring ruffled daffodils, from Roane County Tennessee bulbs. Happy Memorial Day weekend to everyone in the US, as we remember our loved ones who have gone beyond, and all those who died serving our country. And May All Beings Be At Ease, everywhere. Working with nature brings so much peace.. Thanks for stopping by to read and comment on my blog, Sue! My tomatoes are ripening too now, so every day in the past 3 weeks at least I’ve enjoyed a delicious, juicy one in salad or sandwich. This year I planted Cherokee Purple and they are just ready to pick. This is a new one for me, so I’ll report in after slicing into the first big one! It is cracked and green on top but purple-red and softer below the “shoulders,” so it’s time.